I've been working on documentation for SSc4.3 Alternative Transportation - Low Emitting and Fuel Efficient Vehicles and SSc4.4 Alternative Transportation - Parking Capacity. We're providing less parking than is typically required and providing preferred parking for both carpoolers (5% of all spaces) and Low-Emitting Vehicles (LEVs - another 5% of all spaces) for total of 10% required preferred parking. In our project, 10% of total parking spaces is over 200 spots, as this is an enormous building. In the interest of reducing costs, I decided on a strategy where we would group the two preferred options together and simply designate the closest 10% of the parking to both LEV and carpoolers, thus allowing the spaces to fill up in a more efficient manner than if we separated the two into parking clusters. In addition to that, instead of buying and installing 200 signs I proposed that we just stripe the preferred spaces in a different color and have a explanation sign posted at each entrance to the lot. We need paint stripes anyway, and it seems incredibly wasteful to use materials to create 200+ signs saying the exact same thing. In order to establish a meaningful incentive in all potential markets, the parking rate must be discounted at least 20%. This approach is acceptable as long as the discounted rate is available for all customers (not limited to the number of customers equal to 5% of the vehicle parking capacity) and publicly posted at the entrance to the parking deck. The reference guide indicates that anything with a score of 40 or higher on the American Council for an Energy-Efficient Economy vehicle ratings. The fine folks at Harvard pointed out that these ratings don't come out until some time after a vehicle is released and suggested an alternate standard be available. As a result, you can also use the EPA's SmartWay Elite certification in it's place. This was confirmed in a LEED-NCv2.1 CIR dated 10/02/06. The vehicle must be rated as "SmartWay Elite" and not just "SmartWay". Using this database has the added benefit of being completely free, as opposed to the ACEEE database which requires a subscription. I'm not sure if one is more stringent than the other. A number of requests for using a high MPG rating (say 35 mpg or above) were DENIED by the review committee, so don't plan on making that argument stick. The reasoning is there is a consideration for the life-cycle emissions of production of the car and not all MPG are created equal with regard to emissions (the classic example being that 2-stroke engines are much dirtier than 4-stroke). At the end of the day I never did get an answer to the questions about combining and sharing parking spaces for LEV and carpool users, or about the striping and signage. This could be due to the fact that the benefits are so obvious it wasn't deemed necessary to state, but I'd really like to have confirmation. If one of you have tried this and it was accepted please share with all of us by leaving a comment! You may be in for a CIR on this one. I have played this issue on different projects and found that depending on the reviewer you may get differing opinions. Fortunately, the projects were small so buying a sign was not a big deal but 200? On a previous project we did sign a parking lot (heavy snow area so striping alone wouldn't work) for both LEV and Carpools and had no problem from the toughest reviewer I have ever encountered. However always remember past acceptance does not set precedent. On a large projects and /or short-tempered clients where EVERY credit counts, I always opt on the side of safety and get the CIR. On a side note has anyone ever seen a CIR disappear? I swear I had a couple of rulings vanish from the database. Thanks for at least a partial confirmation (with caveats) about the shared spaces. Can't say I've noticed a CIR disappear, but I remember seeing at some point a CIR that reversed the decision of an earlier CIR, so maybe they drop the old one then? I worked on a (much smaller) project where we only needed about 6 low-emitting preferred parking spaces. All but one of them were in a row together, with accessible parking spaces opposite. For aesthetic reasons, we decided to use the same sign poles (front and back) for both the accessible parking and preferred parking signs. Because there are fewer accessible spaces in the same amount of area as regular spaces, and we didn't want to add extra poles, we opted simply to place a sign on each end of the bank with an arrow pointing to the opposite end and the preferred parking text, designating the whole row as preferred. (There was an additional sign in the center) We earned the point on that project, but I don't know if it would work in a different situation. I am working on our submittal for this one today... we are pursuing option 2, and I noticed that the preferred parking signage designed by my PM says "Preferred Parking for Hybrid Vehicles"... I am guessing we will have to come up with some sort of a "green pass" system for EPA SmartWay Elite vehicles instead, and specify that the preferred parking is only for "green pass" holders? I understand having some sort of emissions/efficiency bar that the vehicles should have to meet, but for our project (which has a good bit of retail), the whole system just gets a bit convoluted. Any suggestions? I would consider just a sign that says "Parking for Low-Emitting Vehicles" and leave it vague. You can leave the consumers to decide what that is or have a single explanation for all the spots somewhere nearby? Not really sure how to be effective when talking about transient occupants. My team worked on a LEED office building where the project manager made a last minute call to eliminate the individual signs for preferred parking. Instead he had two signs ordered, and placed one on each end of the bank of preferred spots. Each sign indicated that the spots were reserved for carpoolers or hybrids. USGBC rejected the approach, saying that it could allow hybrids to take all the spots or vice versa. They did accept the method of signs at either end of the reserved section however. So, we resolved the situation by installing signs on each end of the banks. My main beefs with this credit (the preferred stalls for efficient vehicles option) are: 1) that 99% of "low-emitting and fuel-efficient" vehicle drivers are not going to have any idea if their car has an EPA SmartWay certification or if it is on the ACEEE list, and 2) that there is no mechanism in place for enforcement (i.e. you can post as many signs as you want, but who is going to prevent someone from parking their Hummer in one of these stalls?). I realize that LEED certification is a "snapshot in time", as has been described to me, but the above makes the intent of this credit rather flimsy. It is not, however, stopping us from using this option on two of our projects! Your project exposes some interesting difficulties that surface when providing restricted parking. I appreciate that you share the information that was found while researching in addition to your opinions. As a student studying real estate development, I have found that these guidelines are becoming more important as sustainability becomes a larger issue. You mention that "less parking than is typically required [and preferred] parking for both carpoolers and Low-Emitting Vehicles" will be offered. Is this to encourage the purchase of fuel efficient cars or do building codes allow less parking if more privileged spaces are available? I believe that your audience can better infer the motive if you mention the building typology. The scheme is described as "an enormous building", but stating what the structure will be used for might be helpful for readers. Whether or not the intention was to promote using efficient methods of transportation, this parking tactic suggests its importance. Additionally, the photograph that you have selected to compliment the text is a great resource. It gives a visual reference and shows exactly what you have in mind in terms of painting as opposed to purchasing 200 costly signs. It is commendable that you are thinking about conserving materials. Despite the research that you have provided, defining low-emitting vehicles is still rather unclear. The average driver probably does not know what SmartWay Elite Certification or the American Council's rating system entail. Consequently, do you think that an honor system will take affect? It is obvious that a Prius is more likely to meet these standards than a Ford F250, but I think that a lack of general knowledge may lead to misuse of this privilege. Initially, I too thought of using MPG as a regulation, but the counter-argument that you present is strong. What do you think about using stickers similar to those which allow vehicles to use carpool lanes or handicapped parking spots? On a similar note, I am curious to know how carpool parking spots will be enforced. Is this too an honor system? I look forward to hearing your responses and kudos for the informative summary of a lesser known topic. Its October 2009; has anyone found an answer for this question? We've got a project registered under v2.2 and will be submitting the Design Credits within the next 2 months. This credit got denied by our reviewer! The project is a very remote site in Mead, Nebraska. It is an Army facility and is very specialized. 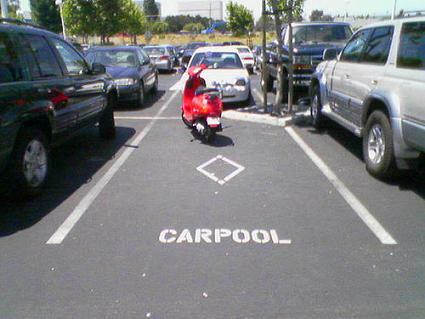 I requested to combine the carpool/Low-Emitting spots. The reviewer denied my explanation about the remote location of this project. LEED-NC vs. LEED for Schools: What's Different?